Could there be a more cutthroat segment in the industry than the midsize sedan one? The midsize crossover segment could also be one, but I find the sedan market to be particularly intense and we’ve seen several automakers just pull out entirely. If the product isn’t stellar, it stands no chance (the Chrysler 200 comes to mind), and so only the best of the best remain. Volkswagen refreshed the Passat two years ago and the 2018 model is essentially the same car as in 2016 model. The vehicle’s styling remains among the more conservative compared to the competition. The straight-line design language we’ve seen from Volkswagen isn’t ugly, but doesn’t stand out in a crowd. Some will like it, others won’t. The front LED daytime running lights and turn signals are nicely done, but LED remains only optional on the headlights and taillights. A fully chromed four-bar grille is a nice touch and the muscular hood works to give the Passat a wide, planted stance from the front, which is its best angle. The test vehicle had the R-Line package which features unique rocker panels, a stylized front bumper with contrasting black accents, a modified rear diffuser, and anthracite 19-inch “Salvador” alloy wheels. The interior of the Passat is decidedly VW and by that I mean tough, firm and feels like it’s all business. In fact, the lack of flair here is a bit too prevalent, even with the R-Line trim and leather seating surfaces. There are simply a bit too many hard plastic surfaces to instil a warm feeling. These plastics didn’t allow me to rest any limbs on them in comfort. Again—some will like it, but others won’t. The overall design of the dash and control layout is functional and easy to use. It’s nice to have buttons that click and push rather than the entirety of the controls being accessed via touchscreen, which seems to be where the industry is moving. The Passat is equipped with a 6.33-inch capacitive touchscreen display which is too small by today’s standards. However, it has a very user-intuitive interface. The MIB II infotainment system offers one of the most comprehensive suites of connected vehicle services in the industry. Both small and large screen systems have the ability to send and receive SMS text messages with Bluetooth with compatible phones and pair two phones simultaneously. Apple CarPlay and Android Auto are also available. One thing the Passat does have in abundance is space. The cabin is very roomy, especially for the rear passengers. They get their own air vents, heated outboard seats are available and USB connectivity is included as well. There is a change for 2018 under the hood where the old 1.8-litre four-cylinder TSI engine is replaced with a more advanced 2.0-litre unit offering more horsepower and improved fuel economy. It’s rated at 174 horsepower and 184 lb.-ft. of torque. The optional 3.6-litre V6 with 280 horsepower and 258 lb.-ft. of torque remains optional. The test vehicle was equipped with the smaller engine which did the job just fine, with plenty of smoothly delivered power for daily driving. The Passat rides confidently at highway speeds and takes turns with elegant ease, all while insulating the occupants from the outside noise very efficiently. A new Passat GT model, unveiled in Detroit and available as of mid-model year, brings excitement to the line by combining the power of the 3.6-litre V6 with a host of unique touches, including 19-inch “Tornado” alloy wheels, a sport suspension, a custom-tuned double exhaust, GTI-inspired front red accent line and red brake callipers, carbon-fibre interior trim as well as blacked-out roof, spoiler, mirrors and window trim. As I said in my opening, this is a cutthroat segment and only the best of the best compete. The Passat is a good car and performs its duties admirably. Is it better than the competition? It’s tough to say, but you’d be well advised to take it out for a test run. If the Passat remains a bit too conservative for you, then the beautiful Volkswagen Arteon (replacing the CC) will be available later this year. Pricing for the 2018 Volkswagen Passat with a standard 2.0-litre engine starts at $26,195. The starting price for V6 versions is $37,795. 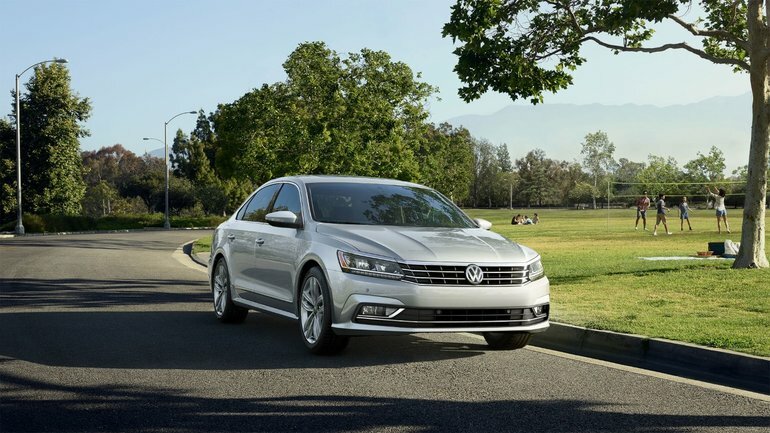 The destination and delivery charge for all Passat models is an additional $1,695.